Frozen Shoulder is a painful and debilitating condition which can affect about 2% of the population. 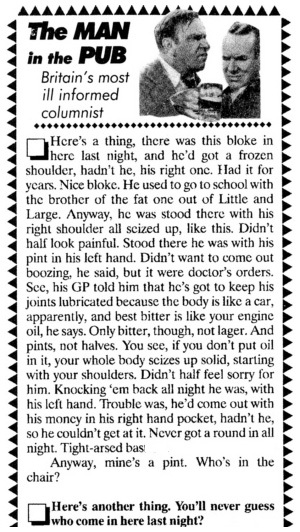 Many people have heard of the problem and proffer well meaning advice, indeed I often refer to it as the ‘man in the pub’s diagnosis’. I hope to outline causes and treatment options in order to minimise the impact on everyday life including sports. The definition of frozen shoulder is ‘a painful global restriction of movement with normal x-rays’. This means loss of the range of overhead movement and also loss of rotation, such as moving the hand to the small of the back and twisting it away from the body. This can cause difficulty washing and dressing; sudden extremes of movement such as the reflex to catch a falling object can cause intense pain. Who gets frozen shoulder? It is most common in the ‘40s and ‘50s and rare in the ‘60s. It is more common in ladies than men, and ten times more frequent in those with diabetes. Other associations are an over or under active thyroid gland, Parkinson’s disease and Dupuytren’s disease (bands of scar tissue in the palm of the hand). Some medications may precipitate the condition, including anti HIV drugs. If you have had one frozen shoulder there is about a 20% chance the other shoulder may later be affected, but rarely both at the same time. What causes frozen shoulder? Most cases are ‘Idiopathic’ which is medical speak for we don’t know! It is characterised by scar tissue forming within the joint binding normally mobile tendons together, and thickening of normally flexible ligaments. It can follow trauma, including surgery, to the upper limb. 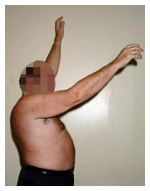 Frozen shoulder is a potential complication of, for example, a wrist fracture, hence the importance of keeping the whole arm mobile with regular exercises despite a wrist plaster cast. It is also associated with ‘impingement’ when spurs of bone rub on tendons in the shoulder, classically affecting tennis players and swimmers. the affected side with an insidious loss of movement. • Thawing stage with gradual return of movement. The whole process may take 2 to 3 years, and even then there may be some residual loss of movement, you have to be a patient patient! Diagnosis is usually straightforward, by your family doctor or physiotherapist/osteopath examining the shoulder to discover the loss of motion. X-rays are taken to exclude arthritis of the shoulder joint, and ultrasound scans clearly demonstrate the scar tissue between the tendons. MRI scans may be helpful to rule out other possible causes of pain such a a rotator cuff tear after a fall, but are not routinely required. In the first instance it is important to reduce pain and inflammation to enable exercises to stretch out the scar tissue. We commonly use anti inflammatory medications such as ibuprofen or diclofenac, but some patients can be sensitive to these drugs, particularly if prone to ‘indigestion’ or asthma. Physiotherapy is advised to demonstrate stretching exercises for the shoulder which need to be carried out regularly. Cortisone injection into the shoulder joint is very useful to reduce pain, and can ‘jump-start’ physiotherapy. Acupuncture and local anaesthetic nerve blocks can also be very useful in reducing pain to allow the stretching exercises. Beware of claims on the internet for various manipulative techniques or alternative remedies without clear scientific evidence of their efficacy, usually accompanied by requests for credit card details. Unfortunately detailed examination of their claims often reveals poor methodology. There is a great resource which independently reviews medical trials and ranks them according to their scientific validity, the Cochrane Controlled Trials Register. Independent studies have shown that a technique of injecting local anaesthetic and saline into the shoulder joint to mechanically stretch the contracted ligaments is significantly more effective than simple injection. This procedure is performed as an outpatient in the imaging department by an experienced Radiologist (X-Ray Doctor) and best results are achieved if a second hydrodilatation is carried out at six weeks, followed by physiotherapy. 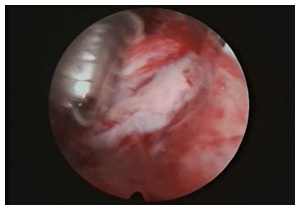 Since adopting hydrodilatation, I have noticed a marked reduction in the number of patients requiring arthroscopic (keyhole) surgery to release severe frozen shoulders. 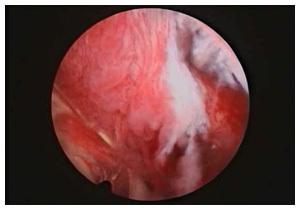 Arthroscopic surgery is considered when the frozen shoulder is not responding to simpler techniques, and particularly if there are associated problems in the shoulder such as impingement (bone spurs) Fig 1 or rotator cuff tears. It is carried out as a day case under general anaesthetic, through small incisions which do not need stitches. A camera is inserted into the shoulder and an instrument the diameter of a pencil used to remove the scar tissue and any spurs of bone Fig 2. This is followed by physiotherapy to maintain the improved range of movement. The success rate is in the order of 90%, but as with any operation there are small risks of complications including infection (1 in 1000). Effect of arthrographic shoulder joint distension with saline and corticosteroid for adhesive capsulitis. Bilateral simultaneous frozen shoulder: a possible adverse event of the FOLFOX chemotherapy regime?